The Wilshire bus lanes project has been in the planning stages for quite some time and still needs the final approval of Metro’s Board of Directors, the L.A. City Council and the Board of Supervisors before construction can begin. The Metro Board is scheduled to consider the bus lanes as part of its monthly meeting on Thursday, May 26. As a prelude, the Board’s Planning Committee will take up the issue at its meeting tomorrow (May 18) at noon at Metro headquarters. The big thing remaining to be settled? The exact location of the peak-hour bus lanes. A comparison of three alternatives that have been studied is above — the focus of the Board will likely be on alternatives A-1 and A-2. The above chart also appears in this helpful PowerPoint on the bus lanes prepared by Metro staff. Metro staff recently released a revised final environmental study of the project with a recommendation for 7.7 miles of bus lanes. 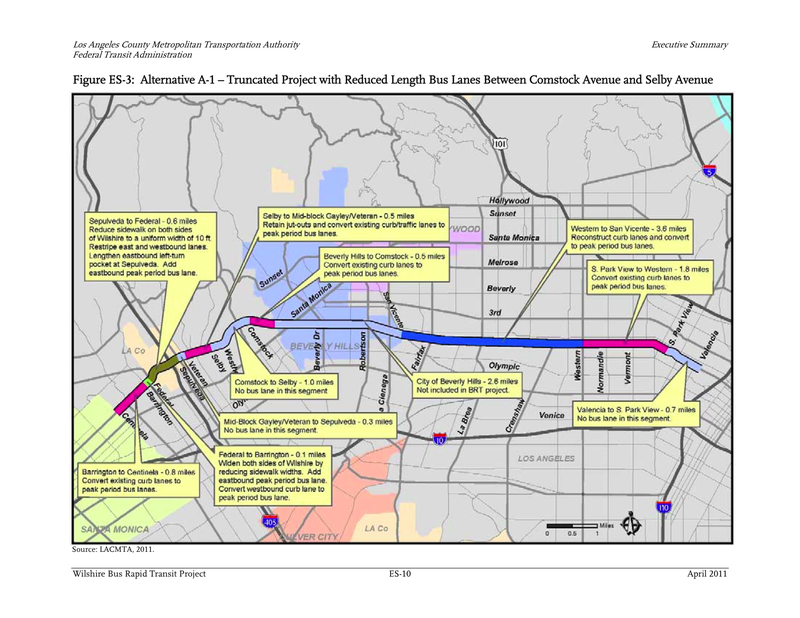 It’s essentially the same project as proposed in the previous study except that, at the direction of the Metro Board, this study evaluated dropping the one mile of bus lanes between Comstock and Selby avenues in Westwood because of community opposition to the lanes there. Some community members said they feared losing one of three general purpose traffic lanes in each direction to a bus lane, saying it would have too great a harm on traffic. In February, the L.A. City Council also asked Metro to consider shorter bus lanes that would only be built east of Beverly Hills. Again, the issue was community opposition to the bus lanes in Westwood and Brentwood. So it’s likely — but hardly guaranteed — that the Metro Board of Directors may choose between one of those alternatives. •The lanes would operate in the curb lane, which is mostly off-limits to parking in the peak hours anyway but is used for general traffic. •The project only includes the parts of Wilshire in the city of L.A. — Metro decided not to include Beverly Hills and Santa Monica in the project. Wilshire is the heaviest used bus corridor in L.A. County and buses can be very crowded and very slow during rush hour. •Metro estimates that bus travel times will improve by about nine to 14 minutes per trip with the 7.7-mile alternative and six to 10 minutes with the 5.4-mile alternative. A recent city of L.A. study concluded that with the bus lanes in place driving times for private vehicles in the peak hours will increase by at least six minutes and maybe more, depending on which project is built. •The hope is that with faster bus service, more people will switch from driving to taking the bus, thereby reducing some of the impact of the project on private vehicles. Currently about 24,000 people are traveling in 20,000 cars on Wilshire during the combined peak periods and 29,000 people are riding Metro buses. With the project, the number of Metro passengers in the corridor during peak times could rise to 33,000 to 35,000. •The project, which includes reconstruction of the curb lanes and some street widenings, is estimated to cost about $31.5 million. The federal government is expected to cover about two-thirds of the cost through a grant; the rest will come from Metro and the city of L.A. 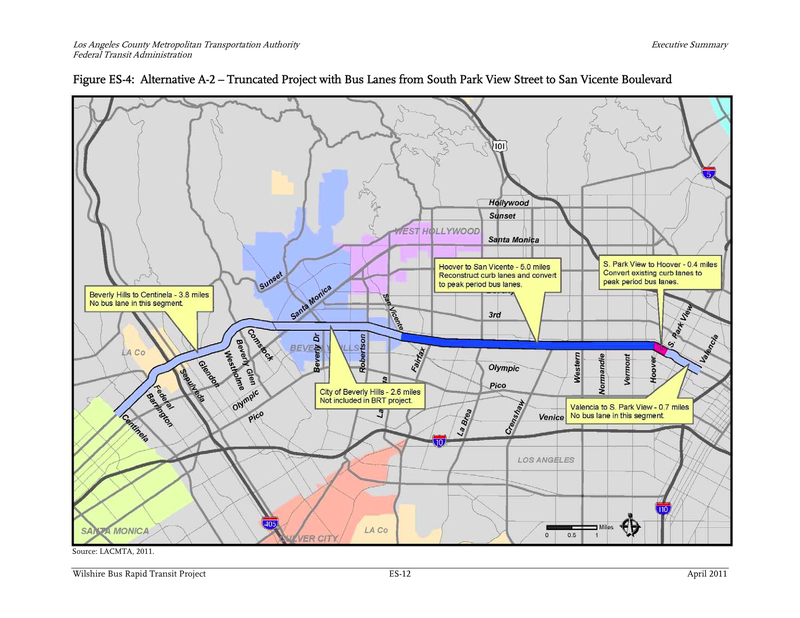 So alternative 2 would completely eliminate the entire west side which has the worst traffic in all of LA… That seriously needs to be reconsidered as even a viable alternative. I wish all politicians voting for the project tomorrow rode the 720 starting from west of Brentwood toward the Metro headquarters in downtown LA. See what its like standing room only while cars with 1 person are taking the whole street. What’s more efficient? A bus with 100 passengers (this is not a joke, for those who don’t ride the 720, it can literally be 100 people) or a car with an average of 1.1 people? What should be prioritized? Metro is dreaming if they think people will leave the comfort of their cars for a packed bendy bus jostling down wilshire. The wilshire corridor buses need to operate at a comfort level of at least the orange line, or better yet put in some padded seats like the old style big blue bus. Alternative A-2 doesn’t make any sense. Why put bus lanes anywhere but the section that actually has the traffic problem? I commuted on the 720/920 at rush hour many times and the parts where it slowed to a crawl was always Beverly Hills and the entire area west of Veteran. At least they should include the latter section, because that would help with the horrible travel times getting in/out of Santa Monica. I would like whoever is advocating these bus lanes to keep emphasizing the fact that more people travel by bus than by car on Wilshire and therefore deserve priority. Ray, you also need to pay attention to that. People are already leaving the comfort of their cars for a packed bendy bus! If you actually look at traffic patterns west of the 405, you’ll see that a big portion of the cars on Wilshire are getting on the 405 freeway, and not going down Wilshire past the 405. 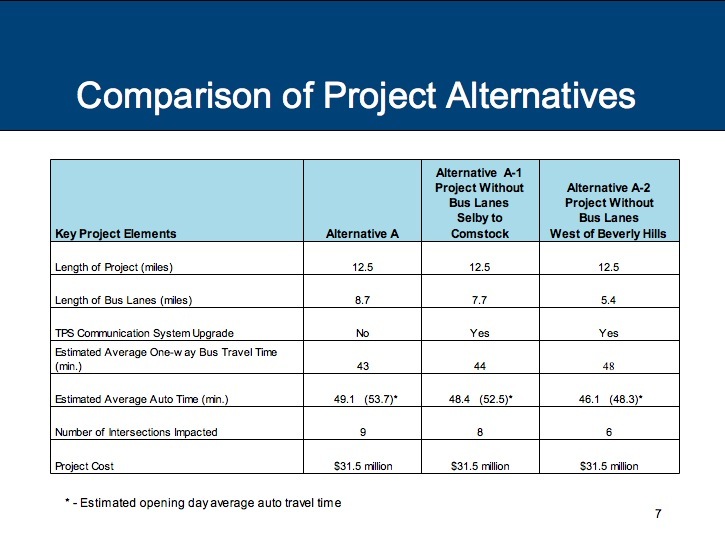 Plus the savings projected by Metro for bus riders west of the 405 is only 1-2 minutes, which hardly seems like enough to get many people who even have the option to switch to taking the bus. Therefore, putting in bus lanes west of the 405 will just tie up traffic even more than it already is, without achieving the goal of getting people out of their cars. This is what happened when LADOT put in trial bus lanes in the area. Traffic in the area is always horrible but is especially bad right now because the 405 widening has cut out some lanes on Wilshire, and that will continue for at least a couple more years. You have to look at the data and not just assume that because the project has the word “bus” in the title that it is a good idea. why, exactly, is the ‘reconstruction of the curb lanes’ necessary? is there something about being designated ‘bus-only during rush hour’ that makes them unsuitable for bus-only travel during rush hour? or non-rush hours? or non-car travel during non-rush hours? or….? ?